Come join us on Saturday, April 7, 2018, for the 39th Annual Native Plant Workshop. Located at the West Sedona School, the doors will open at 7:45 am with a full day’s program from 8:30 am to 2:15 pm. 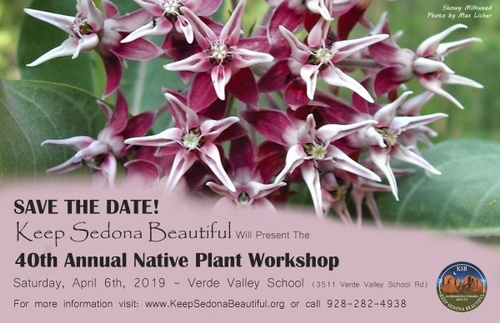 Sponsored by Keep Sedona Beautiful, this program will include two keynotes, two presentations out of six topics, as well as a Silent Auction, breakfast savories and a simple lunch. All this for the low advance price of $25 for KSB members and $35 for the general public. There will be an additional $10 charge for tickets purchased at the event.